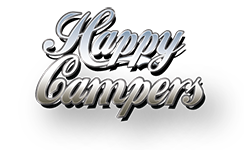 Happy Campers was established in 2011 by business owner Brian Lacey. A lifelong enthusiast of VW Camper Vans, six years ago, he made the brave decision to turn his passion into a business, and he has never looked back. Today he is joined in his business by his brothers Jim and Nicky, his wife Nora, and, the newest addition to the team Peter. As a family-business, one of our core values is to provide a top-class customer service. Since we opened our doors in 2011, we have earned a reputation for our creativity and for the superior quality of our builds. The Happy Campers team are skilled in a range of different areas. Our conversions are carried out by our experienced team at our professional workshop in Wexford. Using only the best materials, sourced from some of the leading brands in the leisure industry. Quality and safety are at the top of our agenda, and we provide a 2-year warranty on our conversion work. Having spent many, many happy times touring and camping in our own campers, we know what works. Our expertise means that we have an excellent understanding of what is practical in a camper. This allows us to help our customers get the campervan that works for them. A Happy Campers conversion is more than just a lavish purchase for occasional use. These vehicles can be used every day and they are economical to run. A Happy Campers camper van is freedom – the freedom to jump into the driver seat and explore the world at the drop of a hat. So, if you’ve been dreaming about owning a camper van, then we are the company that you need to talk to. But don’t just take our word for it, give us a call or make an appointment to visit us at our premises and see for yourself.